Beautiful certificate from the Westphalia, Germany issued in 1923. 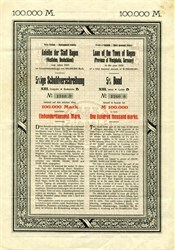 This historic document has an ornate border around it written in German and English. This item has the printed signatures government officials on the back.